I recently crafted Dr. Boom. I was thrilled to finally have the card that I had been teching to get rid of for so long. Now others would have to pull out their Big Game Hunter to deal with MY Dr. Boom. Except, the thrill is already gone. 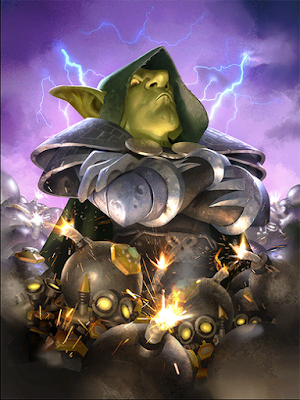 Dr. Boom will only be viable in the new Wild format, which is not the competitive format. As much as I want to have a full collection of cards, my focus has turned to getting as many of the cards I can from The Grand Tournament expansion. 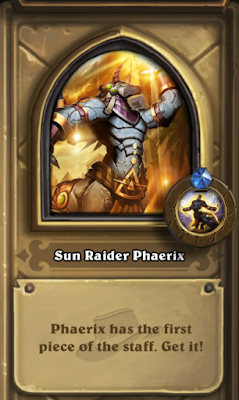 I am still missing some great cards from the classic set, but since I get a pack a week from the Tavern Brawl and another here and there from the Watch and Learn quest, I feel my gold is better spent building on the most current expansion. For a late Christmas gift, hubby told me to buy the holiday deal. I gained quite a few cards from the classic set that I was missing, and with the dust I crafted a few more. Before opening the packs, I was missing only some epics and most of the legendary cards from the set. Here is a list of what I have left to collect from the classic set. 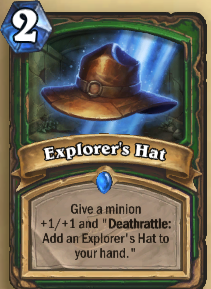 Some of these would be really nice to have, but I think I have done pretty well crafting all the rare and common cards, as they are the biggest part of most decks. I do that with every expansion, so that I make sure to have most of everything I need, then I save up for a legendary. Doing that, if I run up against an epic I have to have, I will have the dust for it, and it only puts the legendary off for a little while longer. Looking at that list, I wish I had just told you what that deal did to better my collection (Sylvanas, Antonidas, Fordring and Alextrasza, oh my!). I dusted a lot of cards, but the results were definitely worth it! 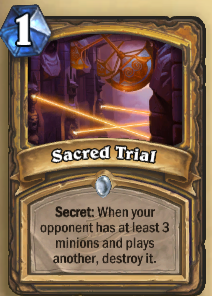 Speaking of legendaries, I saved up enough dust to craft Justicar Trueheart last night, which seems to be a pretty formidable legendary to have put off making for so long. Curse you, Dr. Boom, and your cute little boom bots! So, the task ahead of me seems to be returning to The Grand Tournament and fleshing out my collection, then reworking any decks that do work for me to make them ready for the Standard ladder. 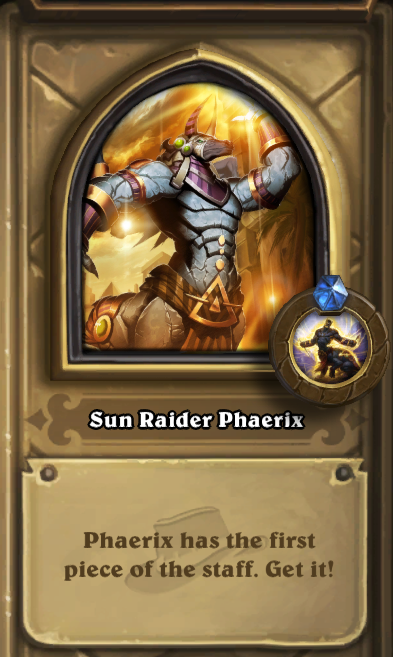 I am missing some rare class cards and a slew of epic and legendary cards. Do I use my gold or do I splurge and buy twenty bucks of fun? I'll probably use my gold, and when the Spring 2016 Expansion goes live I will do better than I did with TGT and buy the special pre-order deal when it is available. I might even think of dusting some cards to help beef up the expansions I'll need to be competitive. So, what do you all think of the changes headed our way? I'm excited to see if I can compete! I rarely kill the last boss of an expansion. I was about to say never, but I seem to remember finishing at least one Garrosh fight in the midnight hours of Mists of Pandaria. I lose momentum a month or more before the big announcement, due to whatever life has placed in my path, and I just don't rejoin at any meaningful pace. It's like I dropped the baton, looked at it sitting on the ground, then meandered off the course to pick a flower, then take a swim, then run back to the starting line to chat with the spectators. I was sitting here (ok so I still am, but go with it, ok?) playing with the WoWhead quest inventory thingy, and I notice there were a lot of things I haven't earned yet. I know, the image is a little distracting. Just look at the tiny number above the line of armor icons that says "missing". I'm missing roughly 1/3 of the quest rewards available to me to wear. This is bad. Delgada got everything done so long before Cataclysm that she has to do a lot of zones over, despite having the Loremaster achievement. But, (giggle) this number is a little faulty. The Tiara of the Oracle quest is repeatable so that if you ever throw it away, you can turn in the items and get another one. The game never counts it as complete, I guess. Del has the whole stinking Oracle set in void storage.I guess she will have to take them out and put them in the bank, just in case void storage disappears. As for Nat Pagle, I swear if he makes her fish up more fish for a stinky hat, I will make sure she always fishes over open water so that he joins Delgada in undeath permanently. What's wrong, Nat? Can't swim? Another problem with these numbers is that it doesn't hide things that you cannot possibly get. I have been twiddling with this tool while writing this, and I found a staff that Delgada would use almost exclusively, except for one little problem. The quest giver won't talk to her. He would rather shove a sword between her rotting ribs and call for reinforcements, then run away screaming. Oh, and there is a cool mechanical looking mace from a quest in the Jade Forest that she can't have, either. I decided I needed to know about the new rules when it came to the improved wardrobe in the next expansion, so I asked my friend Google. I'd ask Siri, but she just doesn't get it. I ask her where the nearest 7-11 is and she tries to send me to Nottingham. I ask her for cheap gas and she sends me to the 76 station. I ask here where the closest McDonald's is and she sends me to their museum. At least Google understands me. The first link after I asked about "new wardrobe rules Legion" was on the Blizzpro forums, and it was helpful. I guess I won't have to worry about things disappearing, but those really special, no longer in game items I will make sure end up in the bank, just in case. I understand it says anything that has ever been soulbound to my character, useful or not, will be available to all the characters on my account, provided they can use them, as a cosmetic option. I just don't want to take the chance! 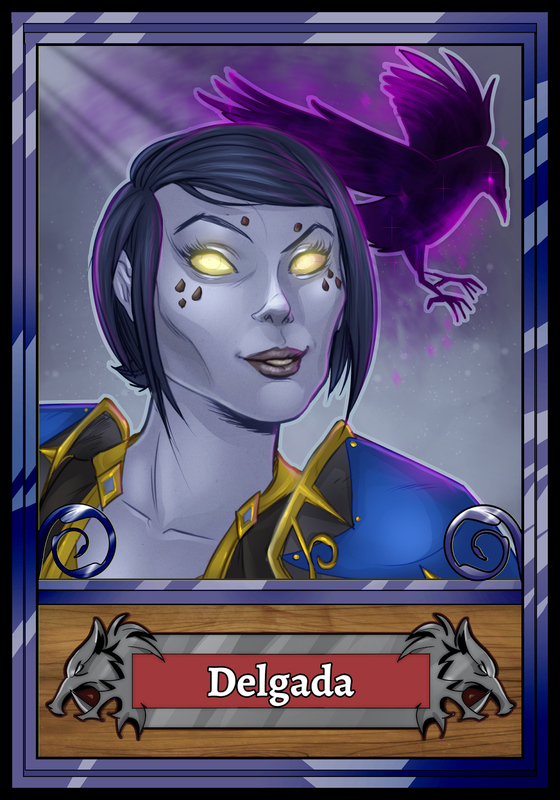 Delgada has really nothing to lose (I don't think she'd mind losing those zandalari bracers, since they're not really a desirable transmog item) But Halinka has her main robe that she would hate to lose (and I would love to gain access to, because va-va-voom! ), so to the bank with those not-found-in-game-files items. Anyhow, so I have spoilered myself a little and looked at some Legion stuff. I'm really looking forward to seeing what I have available that long ago was vendored, disenchanted, or simply cast off to make way for something more valuable. And think of all the extra bag space! I'll leave you all here thinking along with me as I wander off, dreaming of items I can stash in my bank in place of all those tabards! See you in Azeroth. I have finished all that has been released for The League of Explorers adventure, and am playing with a few of the cards. Both Reno Jackson and Brann Bronzebeard seem to be used a lot on the ladder. 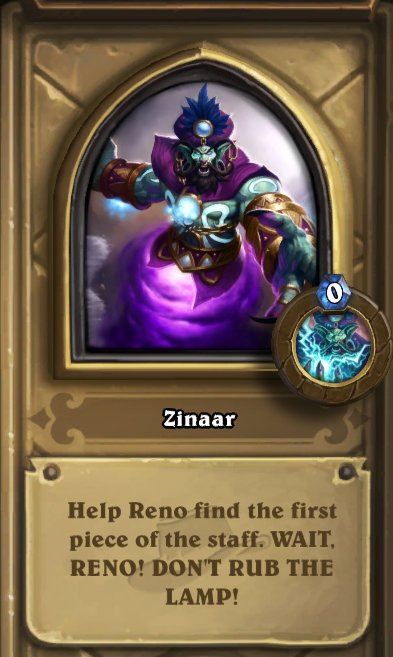 I don't want to commit to not getting the tools I need to play successfully, so that means Reno is not my kind of card. Brann, however, is my kind of man. I reevaluated my Dragon Priest deck to include him and the Jeweled Scarab, and I like how it is working. Here is my revised deck list. Not a typical dragon priest. To add the scarabs and Brann, I removed two Dark Cultists and a Northshire Cleric. During my play before the change, I had noticed I usually didn't get any value from the cultists, and I already had Power Word:Shield and Azure Drake for card draw. Maybe I'll discover another Brann Bronzebeard, or a murloc. The strategy here is to get keep a dragon and hope to get a whelp and/or a technician in your opening draw. Other cards worth keeping on opening are the Twilight Drake and Power Word:Shield, though I have been known to toss back the latter, depending on who I am facing. Brann gave me health, but Earth Shock killed me. In my opinion, this is a control priest deck. Big bodies that can clear early drops, with late game solutions like Shadow Word:Death, Rend Blackhand, and Vol'jin/Holy Smite. Board clear for swarm decks with Holy Nova, and taunts from Defender of Argus to hold back the tide while you recover. Oh, and there is the fun factor of the Jeweled Scarab and Ysera. My work is paramount. Leave me alone! What does Brann offer? First, know that if you drop him on turn three he will be removed. 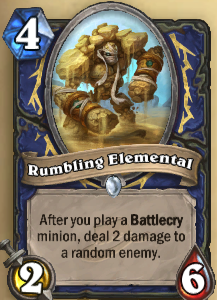 Turns three and four for most players have something that does at least that much damage. For best result, pair him up in a turn to get at least one charge out of him. Turn seven with a nice sized hand can net you a Twilight Drake with quite a bit of health, or turn six a tech with 4/6. 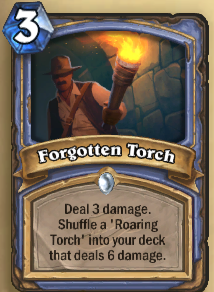 Even turn five can give you a whelp with 2/5, which isn't horrible. Other things that are fun are if you already have your whelp and tech up and slap Brann down on turn 7 with your defender to give your minions 2/2 and taunt. Turn 8 with Azure drake gets you two cards. Turn five with the scarab lets you choose a card, then from a new set choose another card. The only combo I can see as being bad is Vol'jin, as he will swap health twice with the same target, negating the combo with Holy Smite. I have yet to try Brann out with the Corruptor or Rend. I'm sure with Rend he will just work on one Legendary (I'm taking volunteers to test him out!). With the Corruptor, I imagine it will have him shoot twice, but not sure if I will have the chance to target a different target after the first charge. What other fun cards could I use? Keeping with the dragon theme, I could use the Wyrmrest Agent on turn five, making him 3/4 with taunt. I could use Nefarian to gain 4 random spells from the opponent (but Brann would have to have already been played and still active). 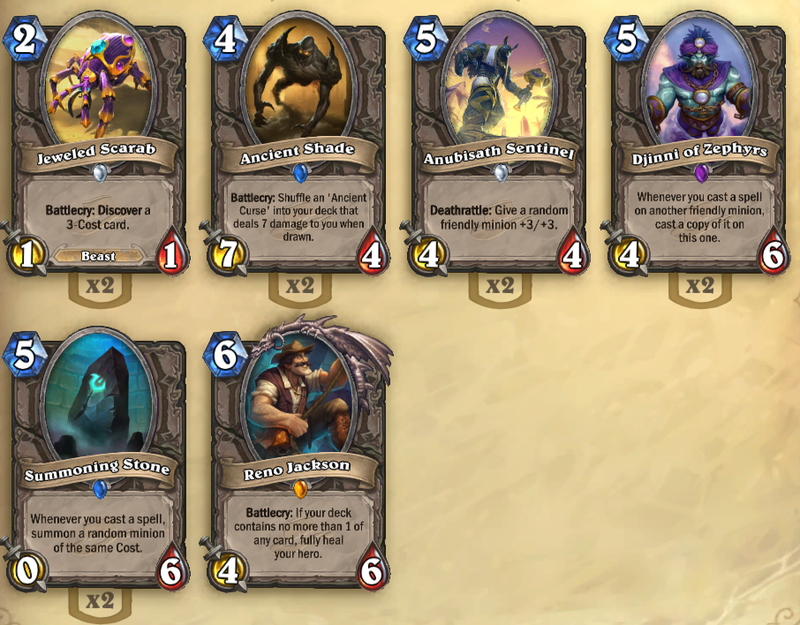 If I had the Twilight Guardian (one of the reasons my dragon priest is so different) turn seven would make him a 4/6 with taunt. There are, of course, the vanilla cards like Abusive Sergeant, Shattered Sun Cleric, and Dark Iron Dwarf that could buff up the damage. How about Stampeding Kodo for those annoying Paladin token murloc decks? I think I'll keep my deck as is for now, but I am having some thoughts on pirates capturing Brann, especially after being killed by a charging 24 damage Bloodsail Raider the other night. Have you been playing around with Brann? What's your favorite combo? I'd love to hear about it. See you in the tavern! My Adventures in the Temple of Orsis. 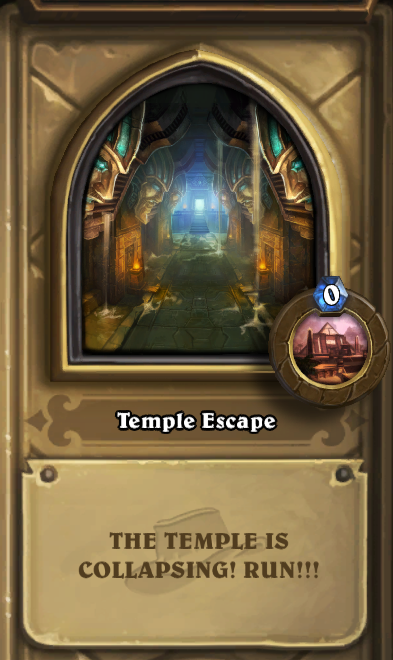 I bought the new solo adventure for Hearthstone today, and I have managed to work my way through the Temple of Orsis pretty quickly. This was pretty easy to beat with my current favorite mage deck. I'm not good at telling what kind of mage it is (I know it's not a freeze mage! 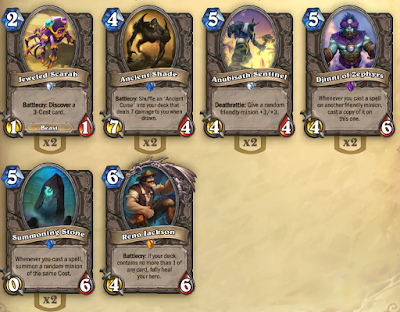 ), so I'll just show you my deck list and you can tell me what type it is, ok? Maybe a new name is in order. One shredder? Anyhow, I managed to pump up one worm to 7 damage before he finally destroyed it. I got another worm out a couple turns later and finished out his last 11 health with the small spells I had saved up. What a maroon! Giving me gifts as I was stuffing him back in his lamp was clearly a bad idea. Kill him and take the staff. No sweat. The whole idea here is to take the staff and keep it. I decided the best person for the job was Andy Wrynn. I pulled out all the stealing spells and minions I could find, added some dragons for good measure, and started swinging. I'll take that minion, and that minion, and that minion! I ended the game with using Inner Fire to smack him with the artifact piece before I turned it in to the team. Fitting end, to be destroyed by the very thing you were dying to keep (cough cough). Run Away, little girl, run away. I decided that Andy needed another go at this one, but this time because of his healing prowess. Here's the final revision I made to the deck. I did have to run this three times to get it right, but I learned from my mistakes! More like rev.5, but I got lazy. Healing and taking the least of the risks seemed to be key. One try I converted the 7/7 that spits out 1/1 taunts and used it on the same turn ( I didn't win that round), which might have been a good idea if I had more health, which brings me back to healing. You still need removal, be it spell or minion, so that is why I added a bit of draconic flavor to the mix. Any spell that steals from cards not seen won't work, as this one has no deck or hand. I'm so excited to work my new cards into my decks. 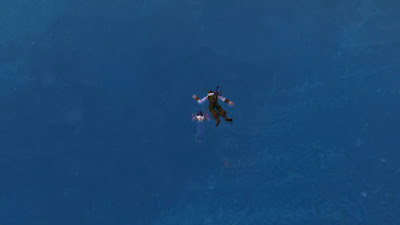 I think I'll wait until tomorrow to venture into Uldaman. The last expedition was very tiring and I think I caught an ancient bug (cough cough)! 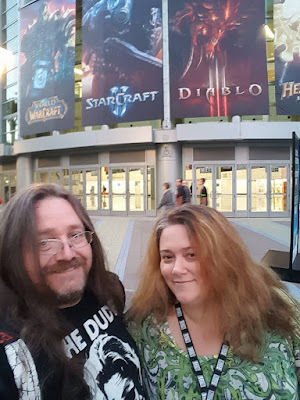 I had big plans for going to Blizzcon and meeting up with people I only talk to in game, but life yanked that out from under me. I told the guy I sold the ticket to that I needed a new washer, which was part true. I would have gone anyway, packed pb&j and other cheap foodstuffs and refilled water bottles and such, but I was given some rough news a few weeks ago and rethought the intelligence of exposing myself to exotic strains of crud from all over the planet. So, I took the lighter risk of attending the Con Before the Storm (which was a bunch of fun!) after I sold my ticket, then went home and got a little sleep before putting in a day at work.I talked to Freckleface from Hearthcast for a bit before their show, said hi to Rewt, and I ran into Scott Johnson as he was leaving the WoWhead party, trying to find a faster way back to the other party to do his cast. Words were exchanged, but no selfies were taken. 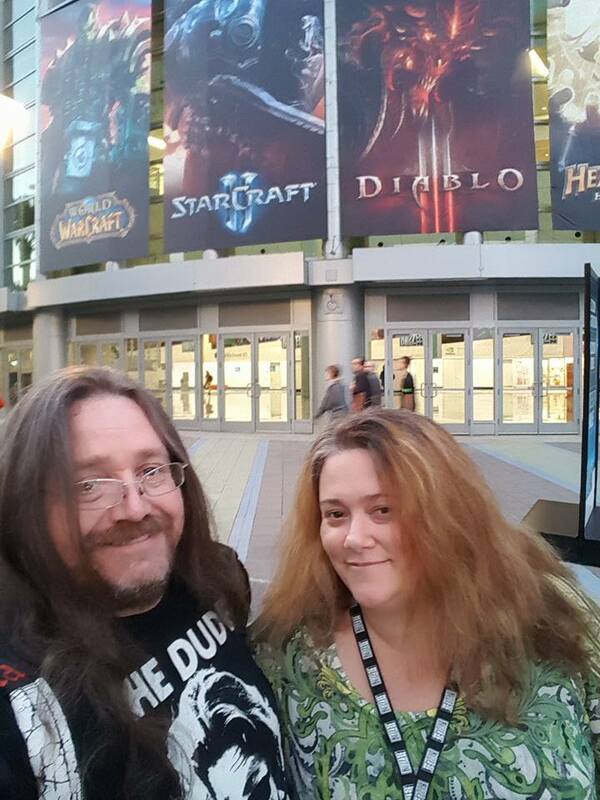 I also ran into Lilulicious (if you twitter with WoW players, you probably know her!) and again, no selfies. Maybe I should put hubby in charge of them, because I forget I have a camera. Old lanyard, so I would blend in, sorta? But look at that arm candy! Anyhow, I'm logged into WoW with my alliance banker sitting in the middle of the Exodar auction house. I just remembered that I logged her in to process a bunch of garbage from Halinka's sight seeing tour in the Ahn'Qiraj raids, plus some extra material from her bank. If I remember to run both bankers regularly, I might be able to get ahead enough to help friends out with game time. 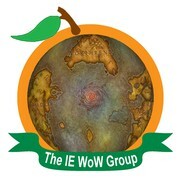 I've got a 2 month cushion now, with enough gold on my horde server to buy at least 2 more. If it weren't for the friends, I wouldn't play at all. I am bored to tears of my garrison, even festooned in webs and the air heavy with ghosts and spiders crunching underfoot. Tuesday I meet with a surgeon to find out when I'll be having a thyroidectomy and how long I'll be out for. Timing is pretty clever, as it seems to be falling over Thanksgiving and possibly Christmas breaks. Good for the paycheck, bad for the festivities. I keep putting this off, so I'm hitting the post button now. Mispellings, grammatical errors, and punctuation be damned, if I don't do it now noone will know, and I'll post some goofy story instead that makes people think I'm having plumbing problems (which for once I am having, but that is a story for another day). Escapist Scrawl by Jennifer Morton is licensed under a Creative Commons Attribution-NonCommercial-ShareAlike 3.0 Unported License.